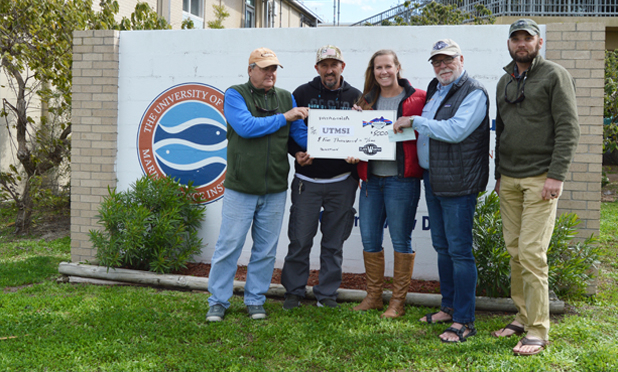 The Mission-Aransas Reserve at The University of Texas Marine Science Institute just received two donations; one from the Flatsworthy, Inc. and Patagonia for $5,000 and one for $889 from Flatsworthy, Inc. in memory of Christopher “Chip” Pitcarin. These new funds will be used to purchase instruments that can assess changes in local habitats of the Coastal Bend. As one of its primary functions, the Mission-Aransas Reserve monitors changes to local bays and estuaries. This includes changes in water quality, such as how salty it is, to changes in the acreage of marsh habitats and seagrass beds. The Reserve documents those changes over time and informs local decision-makers about the results to aid them in management of the bays and estuaries. It’s a natural fit for researchers at the Reserve to team up with Flatsworthy, Inc. who are a coalition of anglers practicing and promoting respect of the bays and estuaries. The donations will be used to purchase a state-of-the-art drone and global positioning system (GPS) receiver. These instruments will allow researchers to collect high-resolution imagery of habitats and detect change over time in specific areas. The researchers are specifically looking at changes to species (such as from mangrove to marsh plants and vice versa), as well as detection and expansion of invasive plants. The drone, in combination with the GPS receiver, will also give researchers the tools needed to measure changes in shorelines - whether the shoreline is being eroded or increasing through sediment deposition. “It’s incredibly valuable to research to be able to partner with a group like Flatsworthy,” said biologist and Stewardship Coordinator, Katie Swanson. “They’re our eyes on the ground and pairing their frequent observations of the shorelines and habitats with these new research tools is very powerful indeed.” The donation received from the Flatsworthy, Inc., Patagonia and the family of Chip Pitcarin further strengthens this partnership and will enable efficient and effective research to understand how our local bays and estuaries are changing.